Blog TOWER OF BAGEL At last the real bagel comes to Sheffield! TOWER OF BAGEL At last the real bagel comes to Sheffield! Tower of bagel is a pop-up bagel café, you can find their delicious vegan bagels with various fillings, soups and latkes at markets around Sheffield. 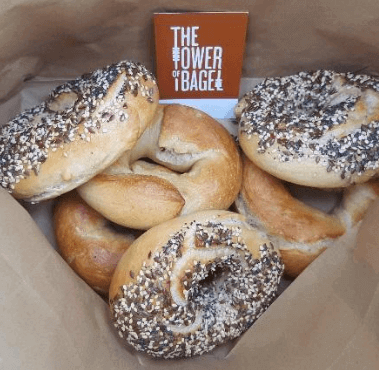 A chance to win a free bag of bagels: Find a token in the bag, tweet a selfie with the token mentioning #ttobtoken and @towerofbagel to get a free mixed bag of four the following week! Take one fresh beetroot and cumin bagel. Cut in half and spread with vegan marge or butter as preferred or drizzle a little olive oil.